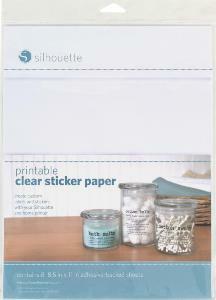 From Silhouette America is the Printable Clear Sticker Paper. Contains eight 8.5 x 11" sheets. Use this printable clear sticker paper with the Silhouette print and cut feature to make custom stickers and labels from your favourite photos and design.